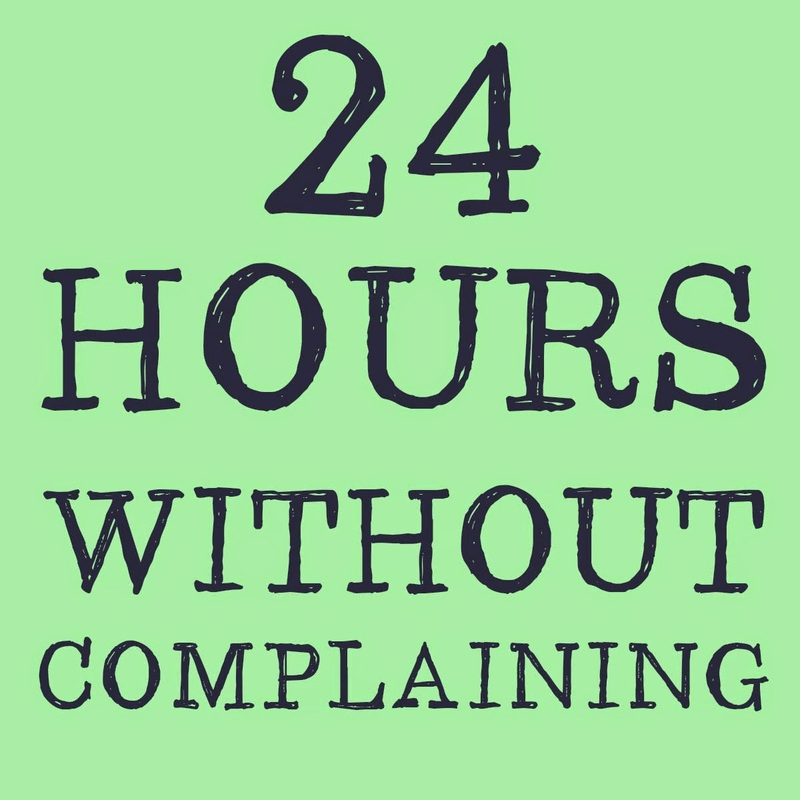 Yesterday I challenged myself to go 24 hours without complaining. While I generally consider myself to be a pretty positive person, I figured that I could still learn something from intentionally shutting down my complaints. 1) It's easy to forget. I intended to start my challenge first thing in the morning yesterday, and didn't remember until around 2pm (2:03pm to be exact) when I shared the blog post to my Facebook page and realized that I had completely forgotten to start. So I instantly rescheduled and told my coworkers about it so they could remind me/shame me if I forgot and complained. Still, I forgot a bunch of times about the challenge, and I don't expect my coworkers spent the day worrying about whether I was complaining or not, so they probably forgot too. This means that I'm not entirely sure how successful I was. 2) I didn't really know how to define complaining. I didn't define my terms before I began. At one point a small discussion occurred around whether sharing bad news counted as complaining, but (to be honest) we got distracted and moved on, reaching no conclusions. It wasn't until this morning (20 hours into the challenge) that I defined the term. And by "I defined the term", I mean "my coworker Googled the definition of the term and we accepted it as fact." The official definition of complaining: "to express dissatisfaction or annoyance with a state of affairs or event", "to state that one is suffering", "to state a grievance". So, for example, when I got into work this morning and realized that my pants had ripped right under the crease of my bum, telling my coworker that had happened was not complaining, that was a statement of fact. When I said "I'm sad that my pants ripped", that was complaining. One could further an argument about the importance of tone as well: if I state a fact in a whiney voice, my tone is conveying dissatisfaction/annoyance/suffering. So both the words you're saying and the way you say them are a part of the complaining package. 3) Trying not to complain created an elephant in my brain. I noticed way more mental complaining yesterday afternoon, after the challenge began. My thoughts were suuuuper complain-y. One is that, because I was trying not to complain I was more aware of the inner complaints that were already there. What was actually going on in my brain was probably something halfway between the two. 4) Complaining made me sad. At 2:03pm today my 24 hours were up, so I ran over to my coworker and let out some big, joking, exaggerated complaints. We laughed that I was "set free" complain once more, and then as I walked back to my desk I realized that I felt kind of sad. I may have been joking in my complaints, but they still bummed me out, pretty much instantly. 5) It's easy to reframe things positively. Once I knew what complaining was, it did became relatively easy (and kind of hilarious) to try to rephrase something that could have been a complaint, in a positive light. For example, instead of complaining that I didn't want to listen to a song that had come on, I stated the positive that I wanted instead: to be listening to a different song. And I said it brightly as I moved to solve the problem. Easy! Depending on how you measure success, I experienced it in moderation. As far as I remember, only a couple of straight-up complaints slipped out, and on a few occasions a sort of whiney sound escaped my lips, a sound that tipped me off that a complaint was coming and I clammed up or found a positive rephrasing. There was one giant grey area: last night my friend made me tell her the story of a male suitor who recently rejected me. I mostly just told the story of what happened, but I did directly say that I was disappointed with how things gone down. That means that technically it would have been a complaint. But I also was saying that because she asked how I felt. So... well, I'm giving myself a half point on this one because I didn't volunteer the complaint, and that was the most positive way to frame my answer. All-in-all it was an educational endeavour. I learned how to define complaining and I learned that complaining makes me sad and trying not to complain makes me complain a lot more in my brain. I think this challenge will be a recurring one in my life. Perhaps a weekly no-complaint day? Then I think I might actually learn and grow into a different kind of sunflower.